As a long standing Wella Red partner, Leigh & Dabian are invited to travel the globe to the annual Red Partnership Forum. Leigh and Dabian will be enlightened and inspired with the new tools and knowledge the forum provides that they will pass on to their stylists in the salon. Verve Hair will incorporate this knowledge into everyday use, allowing the salon to be at the forefront and future of hairdressing. Japan will be inundated with over 100 delegates from Australia and New Zealand hitting Tokyo for the annual Wella Red Forum. The agenda will be made up of business sessions and presentations, previewing Wella’s latest innovations and, of course, sightseeing and experiencing that insatiable Tokyo vibe.Don't miss out capture it all here at Verve hair TV Subsribe NOW . For mor information on this years Wella Red Forum click here. 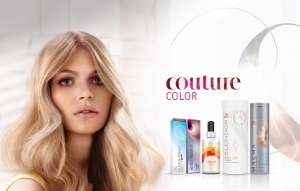 Discover Wella's Couture Color and be inspired by the beauty experience. Each service is dedicated to the craft of exquisite,personalized colour. Customized looks as unique as you, using the most superior products to achieve the results you want. Exceptional hair styling, cutting, colouring, perming,professional straightening, foils and blow drying for both men and women. Verve Hair located in Paddington's Given Terrace, Brisbane. Salon creators Leigh Welch and Dabian Marning guarantee Verve continues to stand out by delivering exceptional customer service backed up by world class products and experienced industry professionals. Delivering our promise of exceptional styling that suits your individual needs every time. Professionals you can trust - smile brighter, walk taller and feel gorgeous every day with Verve.